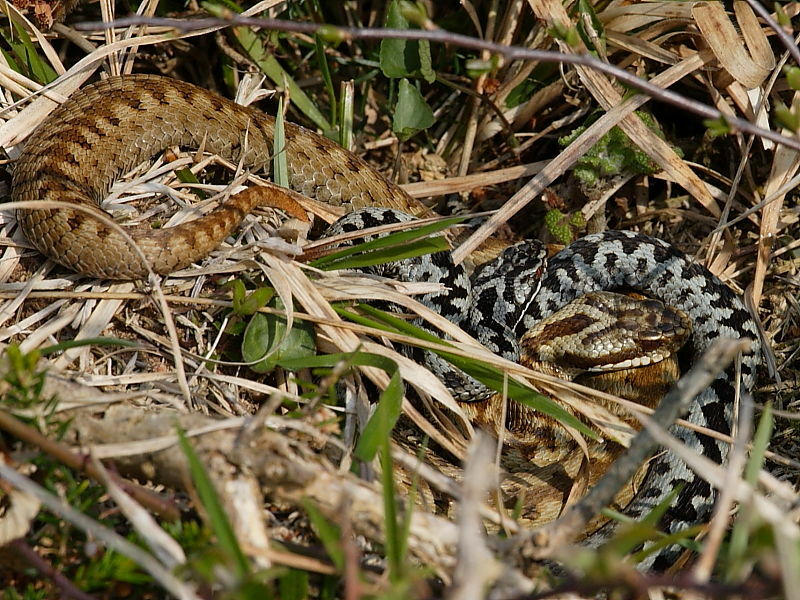 Adders seem to be everwhere we go in Cornwall at the moment – see Is this the Most Southerly Snake in Britain? post a little over a week ago. This pair were curled up amongst the heather at Kynance Cove on The Lizard. I nearly stepped on a female basking in the sun on a track at Windmill Farm Nature Reserve and a female, much to the alarm of a holiday-maker, was on the cliff path at Godrevy Point. For a species reported to be in serious decline nationally there certainly seem to be plenty of the UK’s only poisonous snake in this part of Cornwall. 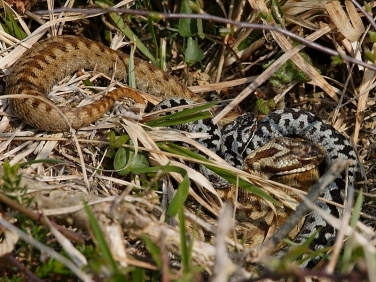 Insight into Adder (Vipera berus): The female Adder or Viper is brown and much larger than the lighter coloured male but both have the zigzag pattern running down the full length of their backs. In order to warm up these cold-blooded reptiles are often found early in the morning curled up on paths and even quiet tarmac roads which absorb the heat of the sun. Hi Sarah. Yes, great isn’t it !!!! They seem to be everywhere. Spring is often the best time anyway to see them and this amazing weather encourages the Adders out onto paths to warm up. However, I wonder if more have survived the winter because it was so harsh. Sounds strange but many species that hibernate often do better if they stay dormant right through winter without being stirred by mild weather. Many parasites are also killed in harsh winters which improves the survival of many species such as butterflies. I really don’t know the answer and it will be interesting to see if our experiences in Cornwall are reflected throughout the rest of the country. You may be interested in the video we took the other day which we will post soon. I have seen 3 adders in Cornwall in the last 2 weeks!!! all male, and unfortunately one was dead in the road. I live in cornwall and have never seen one before. Is there a reason other than the weather?